Mini-steppers keep your toes tapping even when sitting down. Are you the master of multitasking? Then a mini-stepper might become one of your best friends. Small and portable, the mini-stepper lets you take the workout with you to your job and keep your blood pumping while you watch TV, allowing you to get a cardio workout when you're sitting or standing. Your feet never leave the pedals, keeping your mini-stepper workouts low impact. If you think sitting at work is wasting valuable time you could be spending exercising, try sliding a mini-stepper under your desk. Keep your shins straight up, making a line perpendicular to the floor, and place both of your feet on the pedals. You don't have to keep it going nonstop; instead, you can pedal only when you're typing an email or when you're on a phone call. Using interval training can bump up the intensity; pedal faster when you're responding to an email for about one minute, then go slower for two minutes while you take that next phone call. The mini-stepper works at home, too, making better use of your TV time. Scoot to the edge of the couch and step away while taking in your evening dose of sitcoms. By using the mini-stepper while you're sitting down, you can burn up to 100 calories an hour more than you would without it. Mini-steppers offer a decent cardio workout when you exercise standing up, but give yourself some time to get used to the machine. The portability makes it easy to take to work, but the stepper doesn't have handles of any kind to keep you balanced. Place it near a wall to start out so you can balance with your hand if necessary. Push down through the heel of one foot while you almost point the toe of your other foot to let the step lift. Keep your knees soft, which means the pedals won't always go all the way down to the floor. Getting into a steady rhythm is more important than dipping the pedals as far as they will go. The American College of Sports Medicine recommends you engage in aerobic exercise for at least 30 minutes a day, and a mini-stepper can help you meet that goal. After a few days on a mini-stepper, you might be missing the arm bars offered by the elliptical machines at your gym. Don't despair -- adding arms to the mini-stepper is simple. 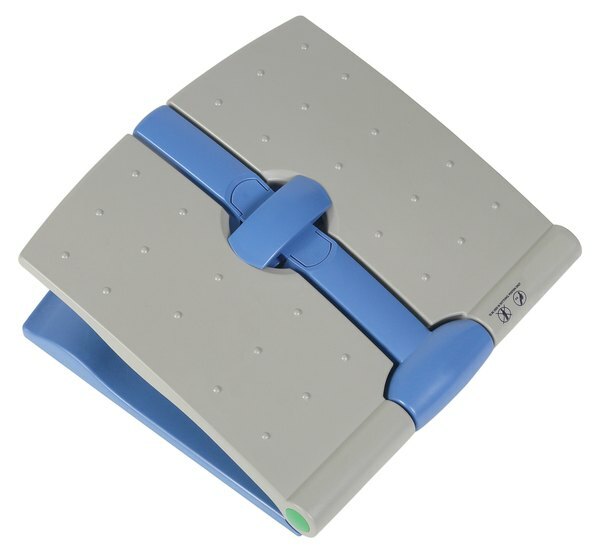 Many mini-steppers have clips or bars built onto the frame that are designed for use with rubber resistance bands. Secure the bands to the frame and perform biceps curls, side and front raises or triceps overhead presses as you step. You can also grab a pair of dumbbells and work your arms, but use fairly light ones at first to make sure they don't throw you off balance. As you build endurance on your mini-stepper, dial up the resistance level so the machine can continue to offer you the workout you're looking for. Higher-end models have digital controls you can change by pushing the arrows, while less-expensive models might have a dial you turn to change the hydraulic pressure of the pedals. Start on the lowest setting until you reach your first endurance goal, such as 30 uninterrupted minutes or three sets of 10 minutes. Turn up the resistance one setting at a time when the current setting becomes less challenging. 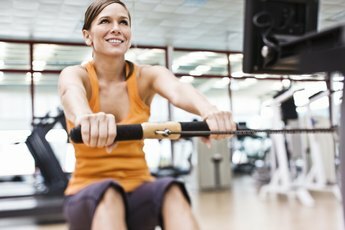 Can You Get a Good Workout on a Recumbent Exercise Bike? Is a Mini Stepper Good Enough for Cardio? 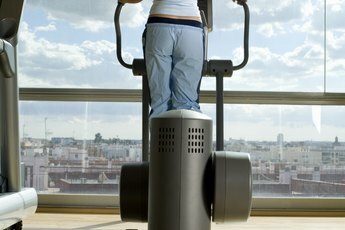 What Exercise Machines Offer Full Body Workouts?